The 1960’s are remembered as a decade of a liberal rebellion, iconic for its rejection of traditional mores, its anti-war protest movements and civil rights activism. But there was another, very different movement that arose in reaction to both the moribund 1950’s consensus and the emerging New Left. Negligible though it may have been, the ‘splinter group’ of extreme conservatives was busily plotting a takeover of the Republican Party and a radical realignment of the American political landscape, eventually transforming the very idea of a political party from a “coalition of interest” to a vehicle of ideology. Fervently anti-Communist, conservatives never lost their forebears’ conviction that the New Deal was a dangerous step along the road to authoritarian collectivism, and they regarded moderate Republicans as willing agents of this agenda. Goldwater’s chief moderate antagonist was Nelson Rockefeller, grandson of the wealthiest human being in history and archetype of the Eastern Establishment. Rockefeller was reviled by conservatives as a “socialist, monopolist, internationalist [and] pro-communist.” He earned their particular opprobrium for pressuring Nixon to adopt an overly-liberal platform ahead of the 1960 convention, in what was dubbed the ‘Treaty of Fifth Avenue‘. This increasingly acrimonious factional divide came to a head at the raucous 1964 convention. Through highly effective grassroots mobilisation, conservatives succeeded in elevating Goldwater to the nomination. The vanquished Rockefeller, feeling no obligation towards party unity, delivered a blistering critique of the newly ascendant right-wing. The Republican party is in real danger of subversion by a radical, well-financed and highly disciplined minority … These extremists feed on fear, hate and terror. They have no program for America – no program for the Republican party. They have no solution for our problems of chronic unemployment, of education, of agriculture, or racial injustice or strife. Goldwater was obliterated in the general election. This was widely interpreted as a final repudiation of extreme right-wing politics in America, especially by moderate Republicans (though not, unsurprisingly, among conservatives, who instead blamed the media). But within this seemingly calamitous defeat lay the seed of victory. In 1962, an actor and former union leader joined the Republican Party. Ronald Reagan came to Hollywood as a Democrat, but during the 1950’s his loyalties shifted to the newly energised conservative movement, with all the zeal of the convert. In his immortal 1964 speech, A Time for Choosing, Reagan mounted an urgent and eloquent defence of Goldwater’s struggling campaign. You and I are told we must choose between a left or right, but I suggest there is no such thing as a left or right. There is only an up or down. Up to man’s age-old dream-the maximum of individual freedom consistent with order or down to the ant heap of totalitarianism. Regardless of their sincerity, their humanitarian motives, those who would sacrifice freedom for security have embarked on this downward path. We need true tax reform that will at least make a start toward restoring for our children the American Dream that wealth is denied to no one, that each individual has the right to fly as high as his strength and ability will take him…. But we can not have such reform while our tax policy is engineered by people who view the tax as a means of achieving changes in our social structure. Have we the courage and the will to face up to the immorality and discrimination of the progressive tax, and demand a return to traditional proportionate taxation? It wasn’t enough to improve Goldwater’s prospects in 1964, but it lifted Reagan to a figure of national prominence. Reagan competed for the 1976 nomination, presenting himself as the conservative alternative to incumbent Gerald Ford, but lost narrowly. In 1980, with stagflation and the Iran hostage crisis buffeting Jimmy Carter’s reelection hopes, Reagan again ran for the Republican nomination, won it, and went on to defeat Carter in a landslide. The ‘splinter group’ had triumphed. In the ensuing decades conservatives would take full and lasting control the Republican Party, and impose an unprecedented degree of ideological uniformity, culminating the kind of radical obstructionism we’ve witnessed during Obama’s years in office. 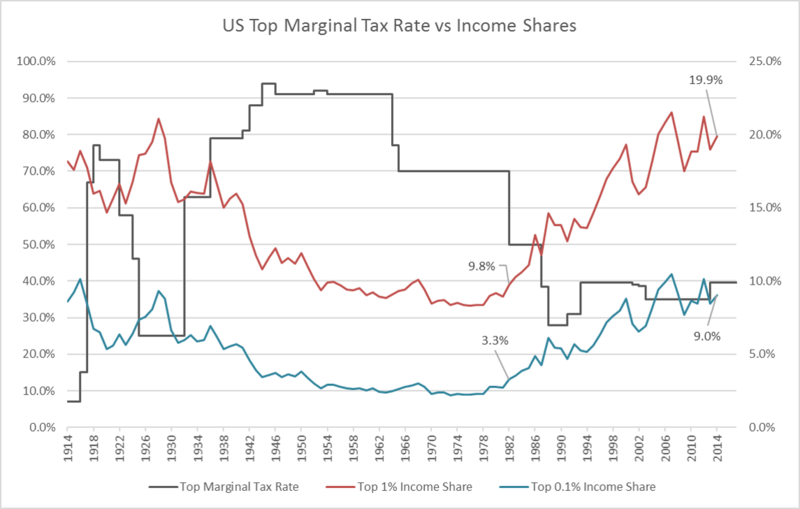 The dawn of Reaganomics, with its hallmark attack on the tyranny of progressive taxation, precisely coincided with the onset of income inequality’s unrelenting upward march. Doubtless there have been other forces driving this phenomenon, but progressive taxation very likely is necessary to achieve changes in social structure, and without it, or without enough of it, income tends towards concentration in the hands of the few. Rising income inequality has only recently become an issue at the forefront of American politics. 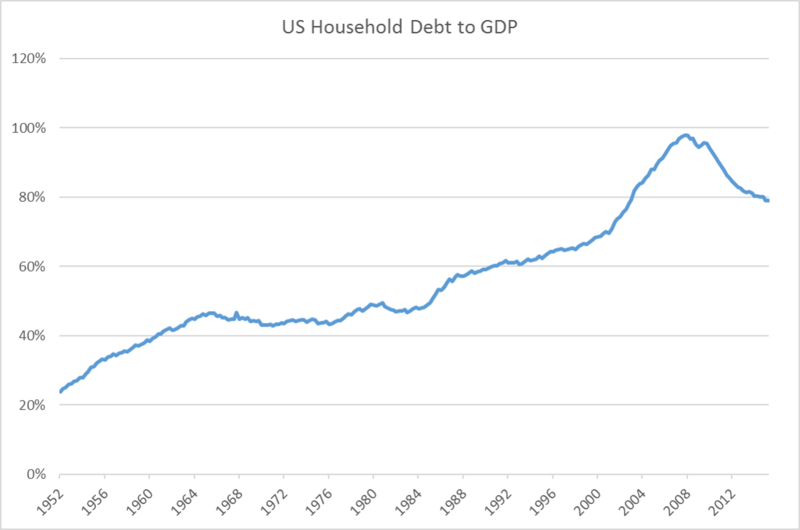 Three decades of soaring household debt masked the growing divergence in incomes, and neutralised any meaningful political opposition to rising inequality. The financial crisis of 2008 changed all that, bringing on the most dramatic deleveraging episode since the Great Depression and brutally exposing middle and low-income households to the full reality of America’s new economic regime. A political backlash was assured; its colour and composition less so. Last week, Donald Trump succeeded in persuading enough voters in the states that mattered that he was the best candidate to address the nation’s inequities. In so doing, the party offering the very same cocktail of policies that initiated the meteoric rise in income inequality, has been handed near-complete control of America’s executive, legislative and judicial branches of government. So what can Americans expect from their freshly elected Establishment-buster? Conservative judges appointed to the Supreme Court. This is especially important. It is highly unlikely that any judge appointed to the Supreme Court under a Republican administration will overturn Citizens United vs FEC, which permits unlimited campaign financing by corporations. These are all, quite clearly, big wins for the well-off, and contrast sharply with Clinton’s platform. As with establishment moderates half a century ago, Clinton’s image as a quintessential political insider was a poor guide to her policy impact. The Democrats’ arrogance and ignorance in failing to identify this weakness has proven enormously costly. There’s some cause for cautious optimism about America’s near-term economic prospects. Trump’s platform, which includes a much-needed boost to infrastructure spending (the sort that Republicans have resolutely obstructed for the last 8 years), is likely to be stimulative, assuming it’s financed by larger deficits. Deficit spending would have been a challenge for Clinton, as it was for Obama, with Congress stacked with extremists prepared to shut down government over budgetary disputes. But since Trump is one of their own, he will probably have an easier time. Moreover, Trump has inherited a much stronger economy than his predecessor, with particularly solid income growth for middle-class families. If he doesn’t spark an all-out trade war, or otherwise err in some fairly unsurprising manner, his first term need not be an economic disaster. But this will not mean he has addressed any of the policy settings fueling inequality in America. Quite the opposite. In electing the man who promised an end to unjust wealth disparities, Americans have voted for policies that will, all else equal, entrench and deepen the divide. This entry was posted in Uncategorized on November 13, 2016 by MJV. ← Which state will usher in the Trumpocalypse?